Opportunistic networks are a group of communication networks in which nodes are mobile with random mobility patterns. Hence, the network topology and connectivity change dynamically and end-to-end communication paths between nodes may not exist. In these networks, it becomes important to seize opportunities to forward data to neighbouring nodes in the hope that it will eventually be propagated to the destination. Forwarding algorithms must address the trade-off between delivery performance (success rate, end-to-end delay) and resource consumption (memory and bandwidth). The main question to answer is : When to forward a message and to whom? Look at the left figure above. The source node S wants to send a message to the destination node D and it decides to forward it to node A. 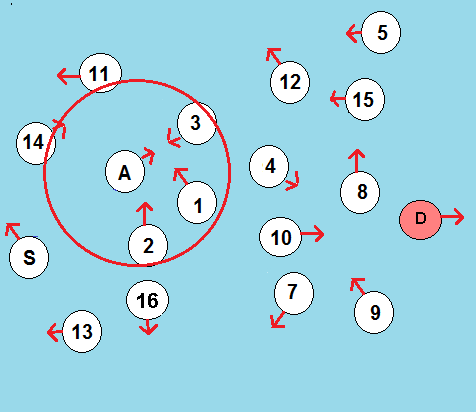 After some time, all the nodes have moved and the topology is as the right figure above. Now, node A should decide on whether to forward the message to some of the nodes 1, 2, or 3 in its communication range or to hang on to it. can produce significant network congestion. 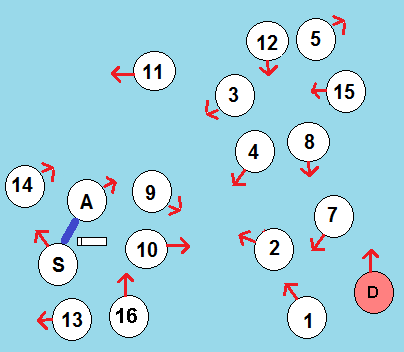 MEED, proposed for vehicular DTNs, are other examples of this class of algorithms. After presenting proofs of the optimality of our proposed algorithms, we confirm their improvement in system performance through numerical simulations. The four comparison metrics in the three test networks using PRoPHET and MinLat algorithms are shown in this figure.The error bars in the graphs represent the $95\%$ confidence intervals. The results indicate that MinLat achieves a smaller average latency than PRoPHET for the test networks. For Net I and Net II, where the assumption of exponentially distributed intermeeting times holds, this is expected from proof. But we observe that the average latency reduction holds also for Net III, where a power-law distribution provides a better fit to intermeeting times. The better performance of MinLat over PRoPHET in terms of average latency is due to our primary goal in developing MinLat which is minimizing the sum of expected latencies of all nodes to the destination node. Also, reductions in hop count and buffer occupancy are side effects of this minimization.The delivery rates of the algorithms are less than 1 because the simulation is terminated before all generated messages are successfully delivered. We conducted further simulations with a different message generation scenario to explore how the incorporation of meeting rate estimations affects the performance of our proposed algorithm MinLat. Figure shows the average delivery latency as a function of time. Messages are generated every $t$ seconds at randomly chosen source nodes where $t$ is uniformly distributed in $[0,1]$. As we see in the figure, the average time it takes for a message to be delivered decreases as time goes by and the forwarding rules discovered by MinLat get closer to the optimum forwarding rules. 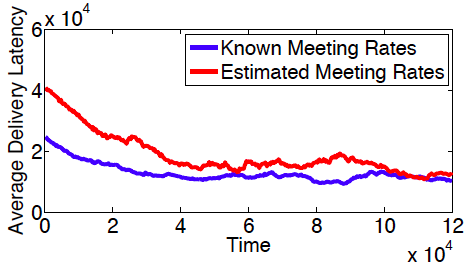 This decreasing trend is observed in both known and estimated meeting rates scenarios, but the convergence to the optimum point is slower when nodes need to estimate the meeting rates.